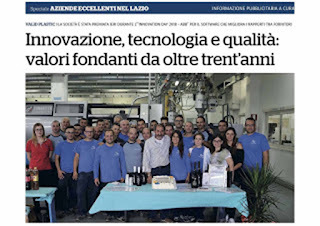 The newspaper "La Repubblica", in its special report "Excellent Companies in Lazio", pays tribute to the Valid Plastic with an article that places, deservedly, the Valeri family's company at the center of the Industry 4.0 revolution. 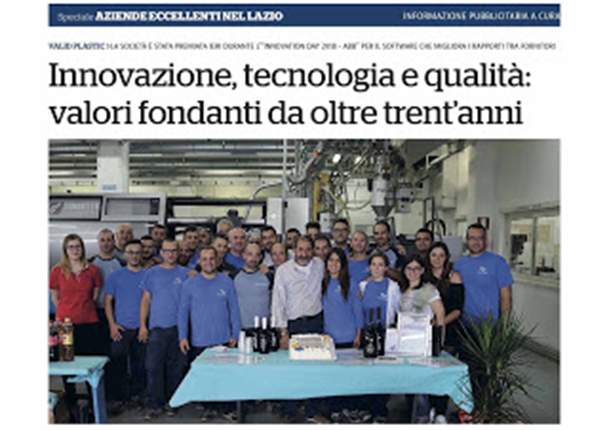 What is celebrated is the software designed and developed by the engineer Manuel Valeri - son of the patron Renato- which besides allowing a continuous exchange of information amongst the company's strategic suppliers allows to keep constantly monitored the products timetable and to reduce delays, thus improving the whole production process. 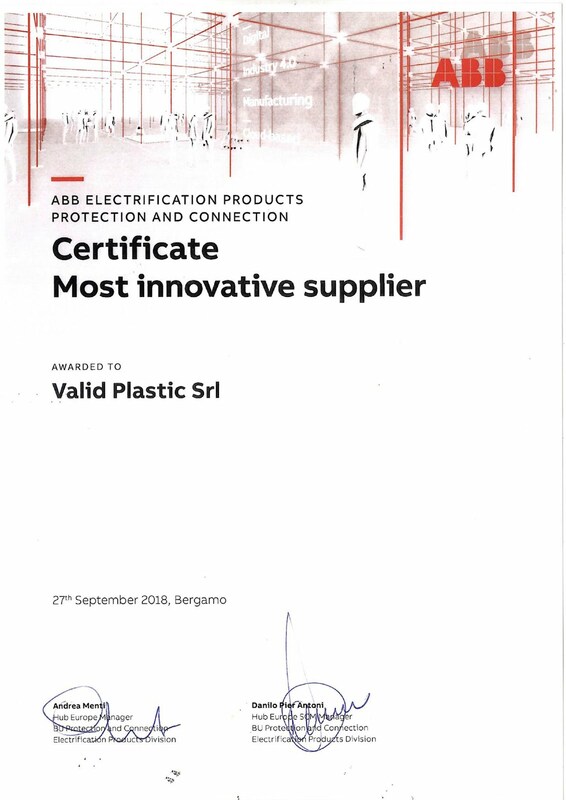 Precisely because of the software features, Valid Plastic has been awarded by ABB with the prestigious "Knowledge Sharing" award during the Innovation Day 2018. 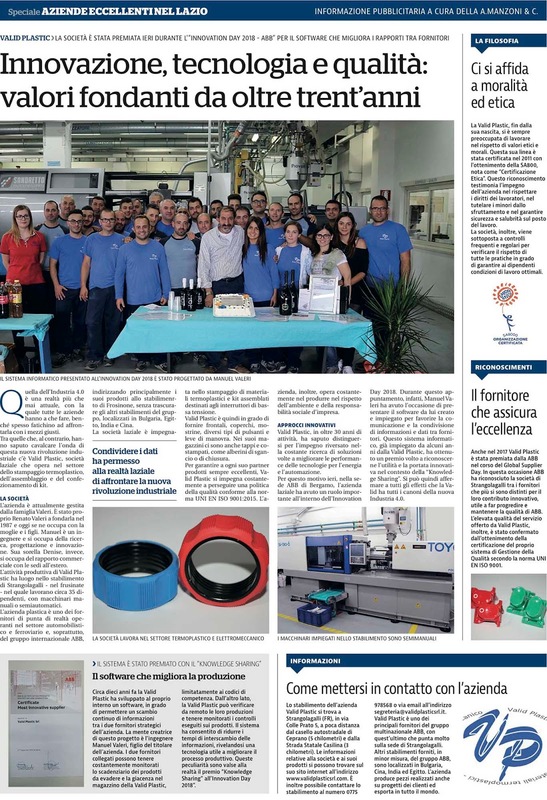 The main Italian economic-financial daily newspaper in its Companies & Territory section celebrates Valid Plastic on the occasion of its 30th anniversary: “The consecration of a story which started 30 years ago thanks to the vision of the patron Renato Valeri, who laid the foundations that today make Valid Plastic an excellence in thermoplastic molding and in the electromechanical assembly". 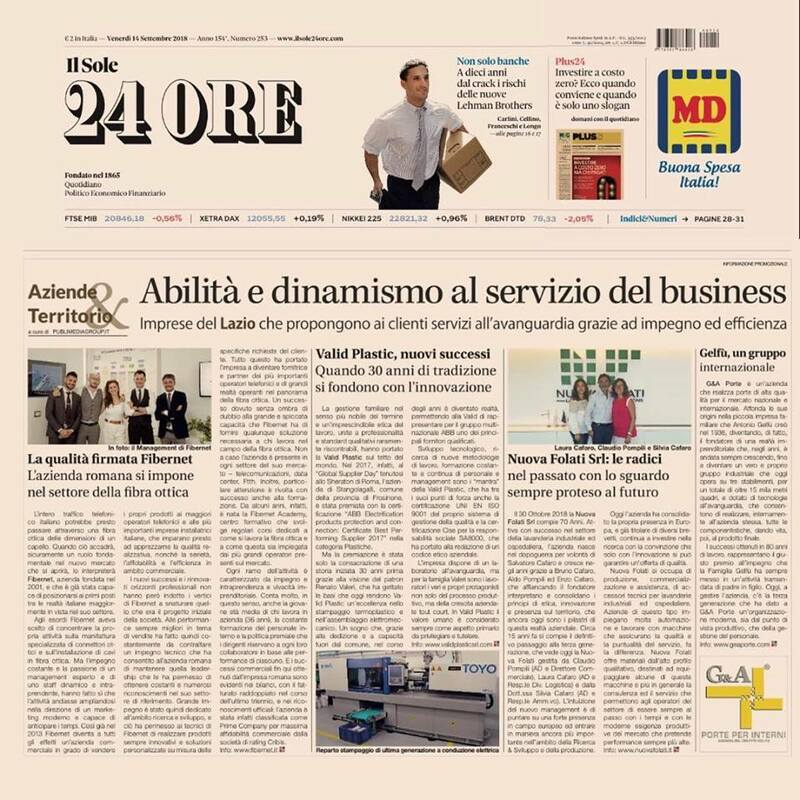 This is why Sole 24 Ore includes Valid Plastic amongst the cutting-edge companies that, with skills and dynamism, offers products and services with quality standards rarely found on a global scale; from family-run company as a strength to work ethics, from the collaboration with ABB to international awards, from constant formation to human value which is always considered as a primary aspect to be promoted and protected. 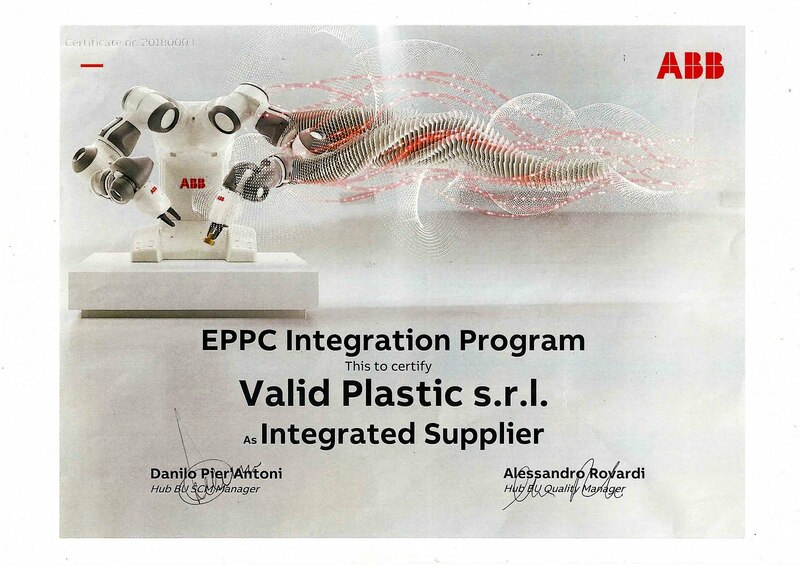 Since 2011 Valid Plastic from Strangolagalli (FR) is SA8000 certified. For the company that operates in the thermoplastic molding sector, as well as in the electromechanical assembly, kitting and packaging, this is the recognition of a modus operandi that for years has implemented the sustainable productivity. The certification, released by CISE (Economic development and Innovation Centre) has enshrined the ethics with regard to work, health protection, safety, relationship with workers among other parameters. Valid Plastic ethical commitment comes from far away- the Directorate (Mr. Renato Valeri)- strongly believes in the need to combine productivity and profits with compliance with the law, ethics and carefulness to its workers. 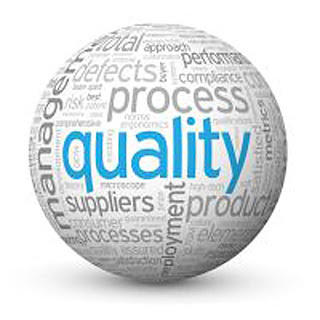 The Valid Plastic Directorate undersigns the commitment for the implementation of the Company Quality Policy. Manufacturing of products free from any defects, in compliance with the requirements established by the Customers and suitable to meet their needs. Keeping a constant focus on the prevention of defects, rather than their remedy. Monitoring suppliers of raw materials and services / products outsourced. Maintaining and improving performance indicators towards our customers in terms of reliability and quality of deliveries according to the targets set by them. 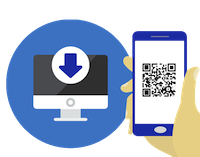 Ensuring customers maximum production flexibility (responding to requests as quickly as possible) and maximum support for quick resolution of complaints and problems. To constantly improve production efficiency, using, without excessive waste, all available resources and at the same time ensuring compliance with the current legal provisions on safety and the environment. The continuous improvement of health and safety performance in the workplace through an adequate control. Creating and maintaining a corporate culture oriented to quality, environment and corporate social responsibility, through the diffusion of this Policy and the sharing of objectives for a continuous improvement. Promoting and maintaining a process of continuous improvement aimed at achieving well-identified objectives. Activate, maintain and constantly improve a Quality System in compliance with the UNI EN ISO 9001: 2015 standard. To periodically monitor the Quality System through the preparation of internal audits, in order to evaluate compliance with the same. 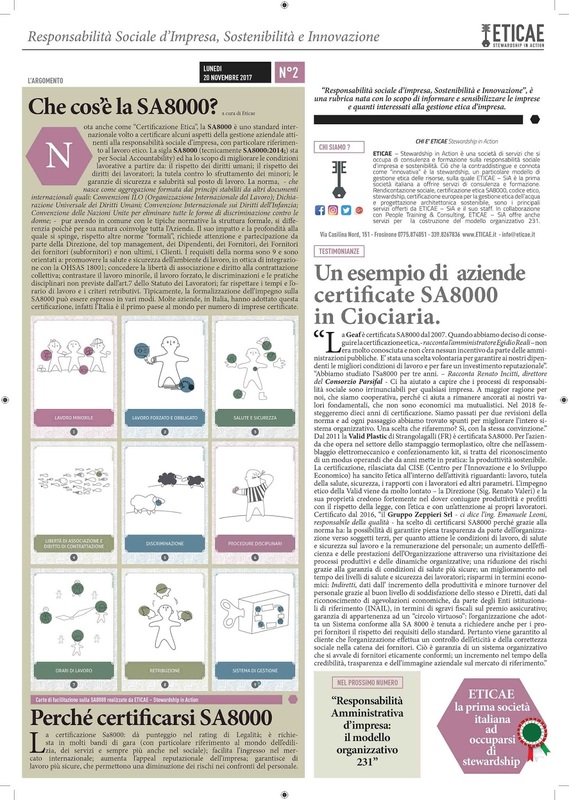 Systematically analyse and manage Customer's complaints through accurate computerized recording and subsequent identification of the corrective actions identified, implemented and eventually the results obtained. Plan their processes with a Risk - Based Thinking approach in order to implement the most appropriate actions to evaluate and deal the risks associated with the processes. Implement the preliminary risks and opportunities assessment related to company processes through internal and external verification activities and the Directorate review. Ensure that the Quality Policy is communicated (through meetings or posted on the bulletin board), understood (verifying at the end of the meeting or during the internal audit phase) and applied to all company levels and available to interested parties on the company website: www.validplasticsrl .com. Make all the necessary resources available and make sure that the planned objectives are compatible with the context and strategic directions of the organization. Increase the motivation and skills of our staff to add value to our customers and our business, through continuous training. The way chosen by Valid Plastic for the persecution of its policy is a Quality Management System compliant with the UNI EN ISO 9001 ed.2015 standard. 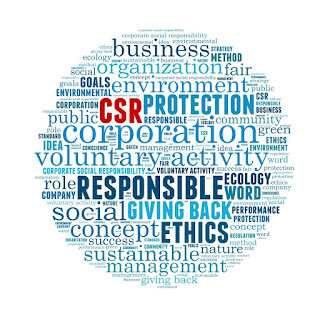 Aware of the central and fundamental role of human resources VALID PLASTIC srl continues its social responsibility's mission which characterizes the company within the framework of the Economic and Social community. 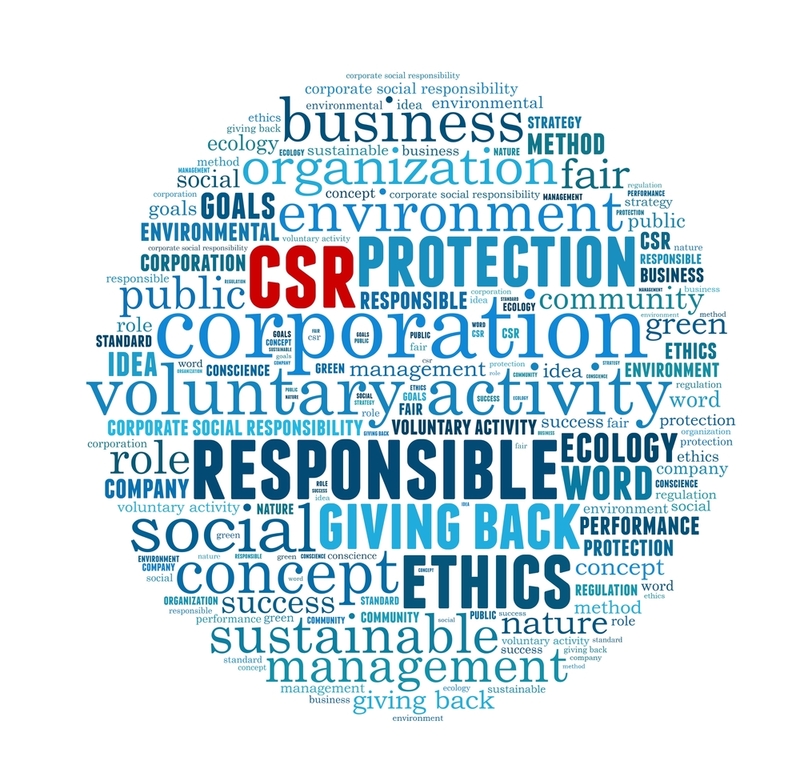 All this underlines a fully support of social responsibility's objectives by adopting a management system based on the requirements of international standard SA8000:2014. In this regard, VALID PLASTIC intends to underline its commitment to all the requirements of the SA8000 standard and to guarantee the constant monitoring and improvement of its management system for social responsibility by defining specific improvement objectives as part of the management review activities and verifying their achievement. It also undertakes to ensure compliance with national laws, other applicable laws and to comply with the rules health related and safety in the workplace, as well as the environmental protection and the human rights defense. This is why it strives to ensure that the following requirements are always met both in the internal work environment and in the supply chain. the denial of forced labor: VALID PLASTIC does not use or support the use of forced or compulsory labor and refrains from using or supporting human trafficking either on its behalf or from other organizations or suppliers. compliance with all international conventions listed in Section II of the SA8000: 2014 (ILO Conventions, Universal Declaration of Human Rights, UN Convention on the Rights of the Child, United Nations Convention to eliminate all forms of discrimination against women, United Nations Convention to eliminate all forms of discrimination, International Convention on Civil and Political Rights and on Economic, Social and Cultural Rights). A proper risk assessment in terms of Social Responsibility. The attention and improvement of the SAW monitoring. the documentation and spread of the Social Responsibility policy. 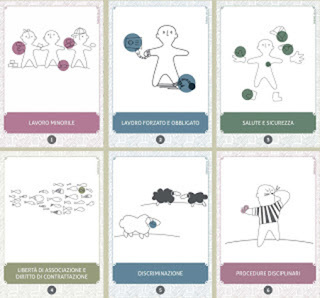 The involvement of all staff in the management of the Social Responsibility System. The resolution of all possible non-conformities found through suitable corrective and preventive actions. The access to premises during audits performed by the certification body for announced or unannounced audits. Staff is considered an element of primary importance. The Company therefore undertakes to ensure compliance with the rules on the employment relationship and to contribute to the affirmation of a positive, open, dynamic and transparent work environment. The relationship with suppliers / sub-suppliers is based on mutual interest and respect for human rights, ethical principles and social responsibility. VALID PLASTIC therefore undertakes to keep active and constant dialogue and monitoring throughout the supply chain. 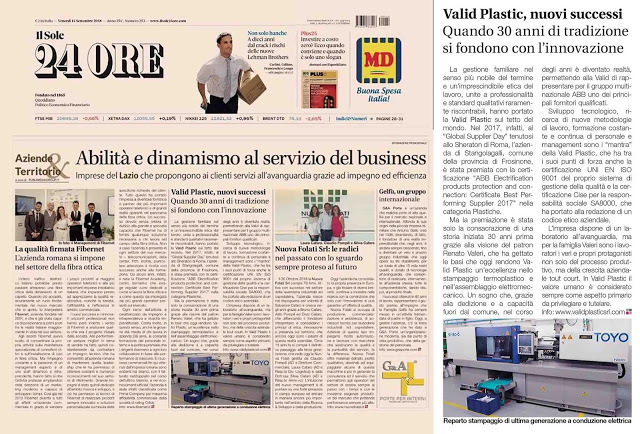 VALID PLASTIC commits itself to consolidate over time a profitable and satisfying partnership for both parties, through the guarantee of an efficient service / product, the compliance with the SA8000 requirements and the code of ethics, transparency in all activities. They are considered vital and fundamental elements for the company, the true tool for the realization of concrete initiatives and for the collective growth of the company itself. VALID PLASTIC undertakes to keep the external communication active and constantly updated regarding the management of its Social Responsibility System. The systematic collection of management data and the continuous comparison help in defining the conditions for a review of the Management System to intervene in the critical points / processes / procedures and to keep active a process of continuous improvement. VALID PLASTIC has identified the monitors to be involved in the CISE SAW Observatory. The Directorate periodically reviews this policy to verify its suitability and effectiveness in relation to internal and external changes. 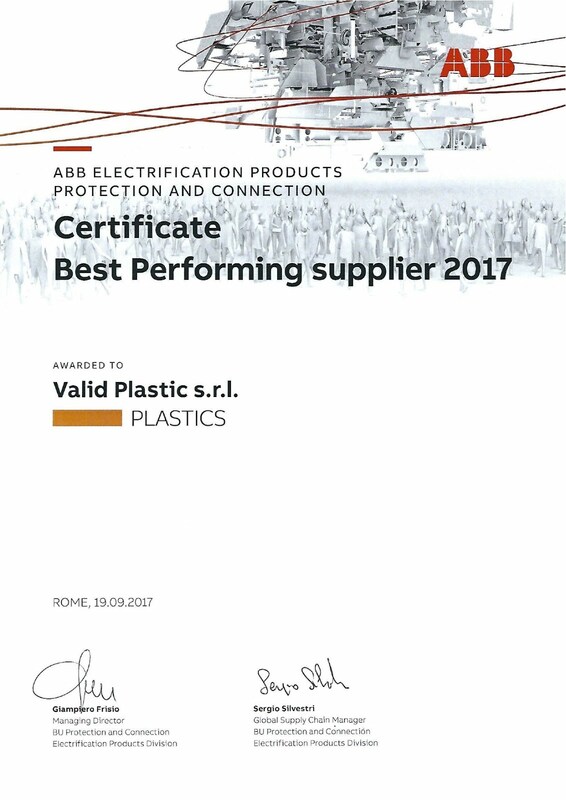 20 september 2017- Awards for best suppliers recognize contributions to innovation and quality advances in ABB’s Protection & Connection business. 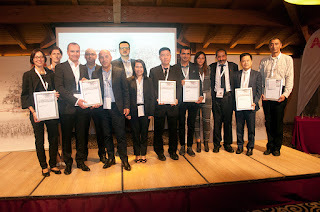 ABB’s Protection & Connection business has recognized the achievements of five outstanding suppliers in its first annual international Quality Awards at the Global Supplier Day event, held yesterday in Rome. Selected in five specialist technical categories, the winners included Xiamen Leelen Electric Control Technology (Electromechanical), Fideltronik (Electronics), Valid Plastic (Plastics), Metalor (Silver Contacts) and Xiamen Xingjitai Co Ltd (Metals). SVI Public Company, a key supplier to seven local business units around the world, was also named as ABB’s 2017 International Supplier Awards’ overall winner. The award-winning suppliers stood out for their contribution to the continuous evolution of ABB’s quality and innovation. They were selected from more than 100 elite suppliers from 16 countries across Europe and Asia who receive privileged access to business opportunities with the company and insights into its future product plans. 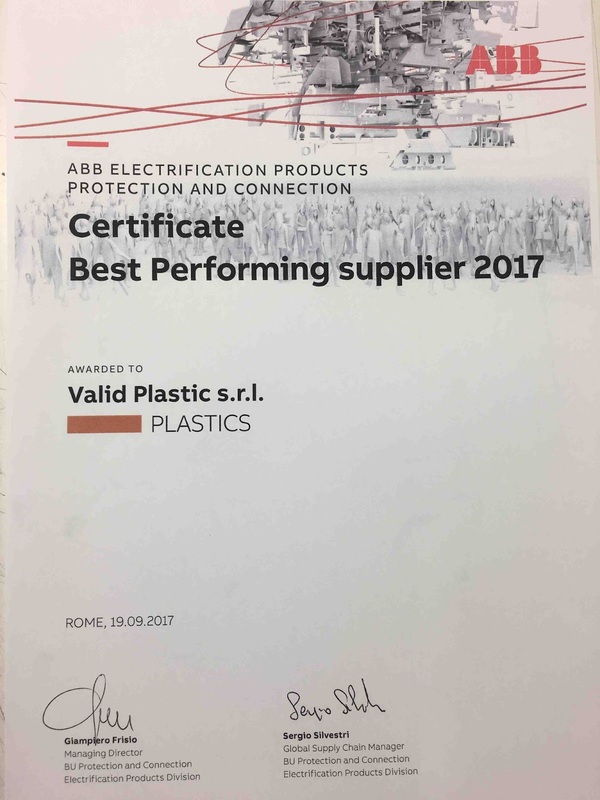 Giampiero Frisio, head of ABB’s Protection & Connection business, said: “ABB’s elite suppliers go to extraordinary lengths to support the launch of intelligent new technologies and continuous advances in quality when bringing robust new low-voltage products to market. 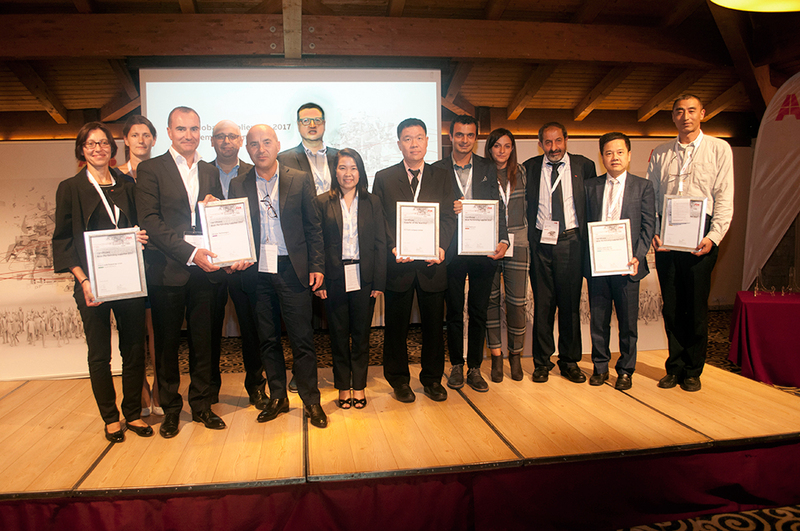 The companies received their awards at the ABB’s Global Supplier Day, held yesterday in Rome. The event was also an opportunity for ABB to provide insight into the company’s technology roadmap, quality objectives and future business opportunities, involving elite suppliers in strategic discussions and planning at an early stage. The digitization of low-voltage power, win-win collaborations and supply chain excellence were among the day’s main themes. Attendees had the opportunity to experience future product demonstrations first hand while network during a mix of formal and informal sessions. 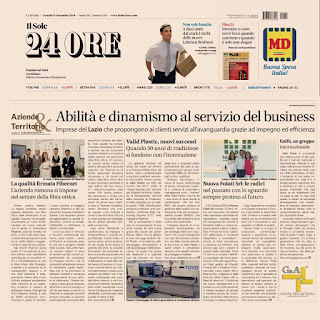 Sergio Silvestri, Supply Chain Manager for ABB’s Protection and Connection business, added: “To reach world-class excellence, while respecting fundamental principles on health & safety, ethics and sustainability, we need the best suppliers in terms of value, innovation, efficiency and quality. ABB (ABBN: SIX Swiss Ex) is a pioneering technology leader in electrification products, robotics and motion, industrial automation and power grids, serving customers in utilities, industry and transport & infrastructure globally. Continuing more than a 125-year history of innovation, ABB today is writing the future of industrial digitalization and driving the Energy and Fourth Industrial Revolutions. ABB operates in more than 100 countries with about 132,000 employees.